Wedding gowns in the Mori Lee Bridal collection are very beautiful, romantic and elegant. Visit Best for Bride Bridal & Evening Wear Boutique to see the newest designs created by Mori Lee. You will fall in love with the look, feel and quality of this line! NEW! Mori Lee gowns are now available for rent at very attractive prices! NEW! Alfred Angelo gowns are now available for rent at very attractive prices! Sans Pareil Collection provides you with wedding gowns that will make you gloriously shine on your special day. Sans Pareil gowns feature unique detailing of crystal beading and elegant embroideries in the highest quality fabrics, finely draped into the perfect style! Sans Pareil stylish silhouettes have been designed to enhance every bride's figure. NEW! Sans Pareil gowns are now available for rent at very attractive prices! NEW! 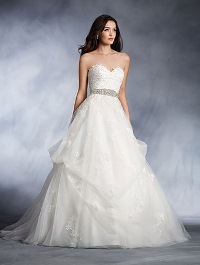 Sophia Tolli By Mon Cheri gowns are now available for rent at very attractive prices! NEW! Alfred Angelo Disney gowns are now available for rent at very attractive prices! NEW! Plus Size Bridal gowns are now available for rent at very attractive prices! NEW! Angelina Faccenda gowns are now available for rent at very attractive prices! * The wedding gowns shown here represent just a samples of the selection available. Your wedding dress is the most important part of your wedding day ensemble. This magical garment will transform you into the bride you always dreamed of being. The perfect dress will not only fit your vision of how you always wanted to look on your wedding day, but it will also play up your best features and match your style and personality. Wedding gown fashion is constantly evolving, and a bride has thousands of dresses to choose from. However, you should remember that not all bridal dresses look equally good on every bride. You have to find a dress that drapes well on you, makes you look like a better version of yourself, and feels comfortable in every way. To find such a dress, it is important that the to-be bride knows about the available wedding dress silhouettes and also recognizes which dress styles are best for her body shape. Let us look at this in more detail. We will begin with the different wedding dress silhouettes available and then move on to dress selection based on body type. There are five commonly seen wedding gown silhouettes, and they are the following. Ball gown: Typically associated with the princess look, ball gowns feature a fitted bodice, that flares into a fully layered skirt from the waist. The distinguishing feature of this style is the voluminous skirt, that hides the lower half of the body entirely. A-line: Like the name suggests, this silhouette resembles the structure of a capital "A", and is narrow from the top to the waist. From here, it flares out softly and flows towards the ground. Trumpet: This silhouette closely follows the natural body shape all the way from the bust to the waist and hips, and it flares out at mid-thigh, in a trumpet shape. Mermaid: Also known as the fit-and-flare style, this silhouette is similar to the trumpet , except that the skirt flares out below the knee. It is a tight-fitting style, that shows off the natural curves of the bride wearing it. Sheath: This style drapes over the bride's natural curves all the way from the bodice to the skirt, and doesn't flare out at all. The sheath is also called the column. Now, let us move on to identifying the different body types and learning about the best dress silhouettes for each of them. The first step to identifying your body type is to measure yourself around the shoulders, bust, waist and hips, and note down these measurements. Then, compare these four sets to determine which of the following body types best describe you. We will simultaneously also look at silhouette suggestions for each of these types. In apple-shaped body types, the shoulder measurement will be significantly greater than the hip measurement. Here, the upper body measurements are typically at least 5 per cent greater than the hip measurements. Recommended silhouettes: Dress styles that flare out beyond the waistline, can best balance out the slighter proportions of the hips. A-line dresses with a bodice that pulls in the upper half, so the waistline is emphasized are good choices. Ball gowns can also be considered for this body shape. Avoid: Fit and flare styles like the trumpet and mermaid, since these dresses emphasize the wider measurements of the top and do not camouflage the thinner leg measurements. This body type is defined by almost equal measurements for the shoulders, bust and hips. When the three measurements are compared, you will find that the three numbers will be within five per cent of each other. Recommended silhouettes: Since this body type lacks curves, the right dress type should create the illusion of curves where there are few. The sheath is a suggestion, as it creates a more curvy appearance. The other recommendation is a ball gown, that emphasizes the slender waist and flares into a thick skirt, thus creating the illusion of a curvy figure. Pear-shaped body types have hip measurements that are at least five per cent more than the shoulder and bust measurements. Recommended silhouettes: Dresses with textured bodices that balance out the upper half, pinch at the waistline and then flow away from the hips and thighs without clinging, are the best choice. Ball gowns can hide the lower body and A-line skirts in fabric that don't cling to the body can achieve this. Avoid: Sheaths, since they add extra inches to the lower half. Trumpets also should be avoided, as they accentuate the stomach and hip area. For this body type, the shoulders and hips are roughly the same size, and the waistline is very well-defined. Here the waist will be at least 25 per cent smaller than the rest of the measurements, while the hip and shoulders will measure within 5 per cent of each other. Recommended silhouettes: Brides with hourglass body shapes can carry off any silhouette with ease. This is the best body shape to flaunt fit and flare gowns like the trumpet and mermaid, though they will look good in any of the other silhouettes also. Plus size brides have body proportions that are larger than average. Their dress size typically corresponds to the regular dress sizes of 14 and above. Generally, these women have a significantly curvaceous figure. 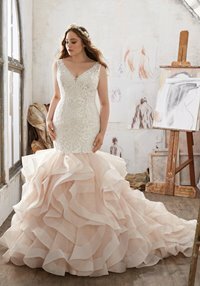 Recommended silhouettes: A-line dresses and sheath silhouettes with empire waistlines are particularly forgiving for the plus-size bride. It is best to choose a dress that plays up the natural shape. If the dress drapes loosely, it will add the illusion of extra pounds and add bulk to the bride's overall look. Dresses with empire waistlines or those that pinch at the thinnest part of the waist are also suggested. Avoid: Sheath gowns as these are not flattering because of the loose drape that will add extra pounds to the overall look. Also avoid fit and flare style dresses, if the waist and stomach area are thicker. Fabric also determines the overall impact. Structured fabric like satin or fabric with a stiffer base are better. Our Plus-size wedding dress collection at Best for Bride specifically caters to the curvaceous bride, and features various stunning designs that are just right to bring out the best features of your natural shape. Petite women are shorter than average, and have a smaller stature. These women have heights less than 5'3", but have a well-balanced overall figure with a defined waistline. 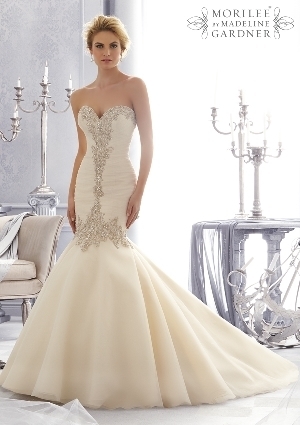 Recommended silhouettes: Trumpets, sheaths and A-line gowns work well for this body type. By lifting the waistline to above the natural position, it is possible to add the illusion of a few extra inches. Details should be small as it can otherwise look overbearing. Avoid: Voluminous ball gowns as this can swallow the petite bride. Also avoid dresses with dropped waistlines, as this can make the short bride look even shorter. Our petite size bridal dress collection features a selection of wedding dresses specifically created for petite brides. It contains both trendy and classic designs, that are just perfect for the beautifully petite bride, without compromising on looks or quality. Finding the right silhouette is only one of the many steps to finding your perfect wedding gown. Once you know what looks best on you, it makes the task of sorting gowns easier. 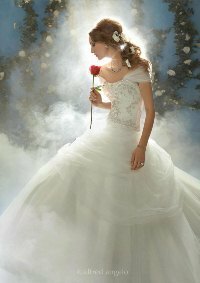 Nevertheless, there are many more factors to consider, to find your dream-worthy bridal gown. Let us briefly touch upon each of them. Budget: Wedding gowns come in different price ranges, from few hundreds of dollars, to several thousands! Shopping without a price range in mind is risky, as you may end up falling in love with a gown that you cannot afford. Have a realistic price in mind, so you can zero-in on the best choice, within minimum time. Also remember that you will have to set aside a part of the budget for accessories, alterations and taxes. Have a clear idea of what you want: Apart from the dress silhouette, you should also have a clear idea of the style, fabric and look you want. Take cues from the venue of the wedding, the weather at the time of your wedding and the formality of the ceremony to decide what features would be appropriate in your choice of wedding gown. Consider your venue: Knowing the place, time and date of your wedding can help you narrow down your choices. Depending on your venue and weather, you can find a dress that will be both practical and comfortable on your wedding day. While a ball gown is a great choice for a formal indoor ceremony, it may not be a great idea for a modern, beach wedding. In this case, you would be better off in a lightweight wedding gown with fewer embellishments. The inputs from your bridal consultant: Bridal consultants are seasoned experts in the world of wedding fashion, and can guide you well. Share your ideas with them, and they will help you find the dress you want. Wedding dress consultants have the talents to identify a dress that may not have hanger appeal, but would look good when tried on. So, give their suggestions a go, even if you don't think you like what they put in front of you. You may be pleasantly surprised with what you see when you actually try it on. Shop at the right time: Shopping for your bridal gown should be a priority task, as it takes time to complete the shopping and alterations following it, so your dress fits you just right. However it should be done no earlier than a year before your wedding, as only then can you make use of the latest offers and choose from the latest collections. Ideally, your bridal appointments should be scheduled at least six months before your wedding, so everything is completed in time for your wedding day. Buy the right size: Do not tempt yourself into choosing a dress that is smaller than your actual measurements. Although you will most likely lose your extra pounds in time for your wedding, we suggest buying the dress in your current size as you can have it altered to fit your actual measurements, closer to your wedding date. In case you are unable to shed the extra weight, you will still be able to wear the dress you bought, as it will correspond to your actual size. On the other hand, if your dress is too small, it will be very difficult to add extra fabric to accommodate your size, and this would compromise your look. Finding the right alteration services: It is highly unlikely that a dress picked off the rack will fit you exactly. You will have to find a good seamstress to alter your chosen dress to your measurements, after you buy it. Getting good quality alterations is just as important as picking the right dress. This is because wedding dresses are complex garments, and only professionals who are experienced in handling these dresses can alter it well. At Best for Bride, we offer in-house alteration services that will allow you to get your dress perfectly sized in time for your wedding. You can find out more details about the prices for each service, as well other details on this page. Finally, you will know it when you finally find your dream dress. Brides who have found their dream wedding gown immediately know that they have made the right decision and don't have any reason to look further. At Best for Bride, we make this dream a reality. Our seasoned staff guide brides through our extensive dress collections from top-class world designers, bringing brides the perfect arrangement to find the ideal bridal gown with minimum effort. Drop in at your nearest Best for Bride store, or call us to enjoy the shopping experience for a lifetime.